BANFF, ALBERTA, Canada –There’s nothing quite like the thrill of white water rafting in the Canadian Rockies. Here the rugged beauty of the mountains and the action-packed adventure of white water rafting make for an unforgettable experience the whole family can enjoy. We bring you the best white water rafting in Alberta, Canada. We also take you to the best Banff rafting sites and offer spectacular white water rafting in Jasper, Alberta. Call us now to make your reservation and enjoy the rafting trip of a lifetime! A true wilderness tour that packs plenty of fun and whitewater adventure along the way. 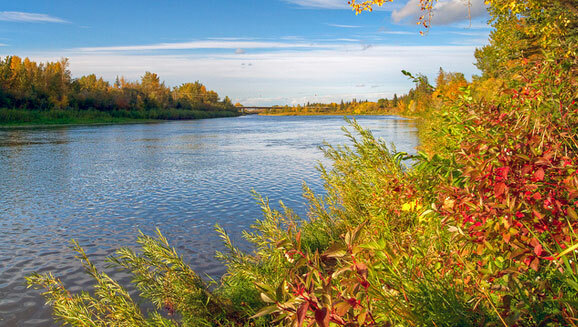 Get away from it all with a day trip to raft Alberta’s famous Upper Red Deer River. The Red Deer Rafting tour offers you the chance to explore the rugged foothills of Alberta and experience some of the best whitewater in the Canadian Rockies. The river is located less than 2 hours from Banff, Canmore, Calgary and Edmonton. All equipment is provided, as well a fully catered Lunch. This trip can only be run for groups of 20 or more. You guessed it! A full day (4½ hrs) on the Red Deer River with exposure to several classes of rapids. -11:00 am Lunch will be served at approximately this time. -11:45 am Release and acknowledgement forms will be signed during lunch. Rafting gear will be distributed and instruction of its use will be demonstrated. -12 noon Lastly, a safety briefing will be given just before departure. -12:30 pm Departure. You will be transported back to camp at the end of the trip by bus to enjoy our camp facilities. All trips depart at the same time from the base camp. Don’t miss this outstanding opportunity to experience the best white water rafting in Alberta, Canada. Our Kananaskis white water rafting tours are among the very best in the industry. Sign up for your Banff rafting or Jasper rafting tour today! Watch this this cool video from Inside out Experience!